Home > News > Lost SNS worker: Can you hear me now? Lost SNS worker: Can you hear me now? Supplies: He may not have had food, but he was packing his digital camera, his cell phone and water. Boy, folks at the SNS really push to keep that project on schedule. 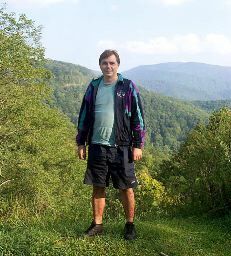 Slava Danilov, accelerator physicist, was lost without food or cover for about 50 hours in the Cherokee National Forest last week. But that didn't stop him from grabbing some cheese crackers, a bit of ointment for his scraped up body, and heading back to the Spallation Neutron Source project within hours of being picked up about an hour's drive (and likely 30 to 40 miles of walking) from his car. "I did not have food, but still I was full of energy probably because of the adrenaline," said Danilov, who started his adventure on Wednesday from the North Carolina side of the forest, thinking he was in for a couple of hours of light hiking. Once inside the forest, trail markers were less than clear and even this experienced hiker (he's hiked many of the Great Smoky Mountain trails and all of Frozen Head during his five years in Oak Ridge) couldn't untangle an unexpected web of interior paths, crosscuts and latticework-byways that are the trademark of the park. "I was probably in about six miles, and there were all types of postings and markers that had been destroyed," said Danilov. "I realized then the trail was dangerous and decided to turn back." However, that decision didn't get made until just before dusk. So when daylight finally drained, Danilov decided to spend the night "with my jacket wrapped around me to hoard my hot air." Next morning he was up early for an estimated 15-mile jaunt before mid-day, in an attempt to find a trail to the Cherohala Skyway, a 40-mile long two-lane road traversing the Cherokee and Nantahala forests and connecting Tellico Plains in Tennessee to Robbinsville, N.C.
"But no, I do not find the Skyway," said Danilov. "Then I am too tired to go back, and finally made the correct decision to go north and west to either cross the Skyway or to find Tellico Plains and the facilities there."